TonyP Since I had never used this product, I was a little hesitant in using it. I had a small water damage under a skylight and the popcorn was coming loose. I repaired the damaged area and used Homax Ceiling Texture match popcorn to finish. It turned out perfect. I think the trick is to follow the instructions and video exactly as shown. Great product. I recommend it and will use it again if I have to. Works great when you follow the directions! lancerman I have used this product 3 times in the last year. The first time it was a complete failure because I used it on a non repaired slightly damp ceiling hoping for the best. The second time, the area was dry but i did not shake the can long enough or properly prime the area. I had mixed results. I really needed this product to work so this last time I used it in another location I cleaned, patched, primed and let the approximate 2 foot area dry perfectly. Followed the application directions to the letter and it worked great!! I believe that because it is in a spray can our expectations are that it will be a complete shortcut. 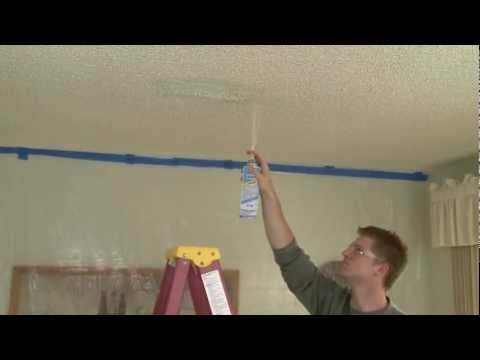 It is simply an easier way to apply popcorn texture to a small patch in a ceiling that is properly patched. inexperienced This worked well for us. We shook the can for 5 to 10 minutes and used a box as shown in the video. We will need to get another can but we were pushing the 2 square footage application limit. The video was true to form. Jeff_DIY The 8 reviews posted during the past year were very helpful, the product how-to video was slightly helpful. Used 4 cans to blend the popcorn texture along the edges of a 4’x8’ sheet of new drywall (contractor left notable popcorn transition). Shook each can 30-90 seconds to dislodge the clump of texture inside the can and then shook for 10 minutes. Used short half second bursts and material hit the ceiling in small soft clumps and no drips. Can was 12”-14” inches from ceiling and moved at rate of 5 feet per second. Three cans ejected nearly all the texture material, the fourth can plugged after ejecting about 40% of the material. First-time user and easily corrected the unevenness of popcorn texture. AMI IF you don't want to deal with the mix and hopper and IF you don't care if the patttern doesn't match this is an OK soloution. You have to use very short bursts while moving the can quickly and keeping a fairly uniform distance (about 12") from the surface. It is also messy so plastic sheet everything and use a drop cloth - it drips a lot. 2 cans applied about 30 minutes apart did a good job at covering an 18"x25" area. Barb56 This is one of the worst products I've ever used. The product didn't perform well, and I did follow the cans directions. The majority of the product stayed on the nozzle and fell to the floor. The 'canned' responses from Homax state to use only half second bursts. Really??? The instructions on my can direct to 'spray continuously'! Absolutely horrendous product and disappointing responses from the company. Photo of operating directions attached. Worse product I've ever used. I have run across some bad products in my 60 some years on this planet, but this is by far the worst. I wore my arms out shaking the can, the first time was over 10 minutes. On a scale of 1 to 10, 10 being the best, I would have rated the 1st car at an 8, the second can at a 6, but the last two cans were at a 0. I wasted my money on the last two cans. I used the short bursts and after about three short burst the product quick and that was that. Mappie99 I thought that spraying the popcorn would be the easiest part of repairing my ceiling. This product, despite reading and watching how to videos, did not perform as expected. I did get popcorn all over the floor and myself, but only watery paint on the ceiling. What did I do wrong? How can spraying texture go wrong???? Dissappointed This is really bad. Squirts like water, drips all over and does not produce a popcorn affect. A little sawdust with white paint applied with a sponge will do a better job. Homax Aerosol Ceiling Texture, Professional Match,16 oz. is designed to match originally commercially applied popcorn texture – without the use of a hopper gun. The formula contains actual polystyrene chips in an easy-to-use aerosol so you can finish your popcorn ceiling repair project quickly and move onto your next job. 16 oz. covers up to 2 sq. ft. Match original commercially applied popcorn texture without the use of a hopper gun. The Homax ProGrade Popcorn is formulated using material that contains actual polystyrene chips. Homax Aerosol Ceiling Texture, ProGrade Popcorn is the fastest way to patch commercially applied popcorn ceiling textures. To achieve the best results, please read the following directions carefully before starting your textured ceiling repair project. TIP: Pin up plastic drape or hold a box around patch area to contain overspray. DO NOT spray sideways or upside down. DO NOT clear nozzle or test product by spraying upside down. DO NOT hold nozzle down for more than 1 second. DIRECTIONS: MAKE ANY NECESSARY CEILING REPAIRS BEFORE APPLYING. PRIME/SEAL AREA WHITE BEFORE APPLYING TEXTURE. Shake can vigorously for one minute. Screw nozzle onto valve stem. Place fingers on either side of the spray nozzle and hold approximately 9-14” from ceiling surface. To spray, quickly trigger nozzle in half second bursts, releasing the nozzle after each pass. Use short, sweeping strokes, feathering texture into surrounding area. If nozzle is held down continuously propellant will be released in 2 to 4 seconds leaving unused material in can. Proper technique allows for 8 to 10 short application strokes. DRY TIME: Allow texture to dry 24 hours if painting over is desired. TIP: For a heavier “chip” appearance apply in multiple thin coats, allowing texture to dry slightly between applications. Do not apply too heavily or texture will drip or sag. WARNING! CONTENTS UNDER PRESSURE. CAUSES EYE, SKIN AND RESPIRATORY TRACT IRRITATION. Read other cautions on side/back panel before using. Contains Calcium Carbonate, Clay, Perlite, Titanium Dioxide and Nitrogen (propellant). Store upright in a cool, dry place. Avoid prolonged exposure to sunlight and other heat sources that may cause bursting. Do not puncture, incinerate, burn or store above 120°F. Use with adequate ventilation. Avoid breathing spray mist. Avoid contact with eyes and skin. Wear safety glasses or goggles. Wash hands after using.